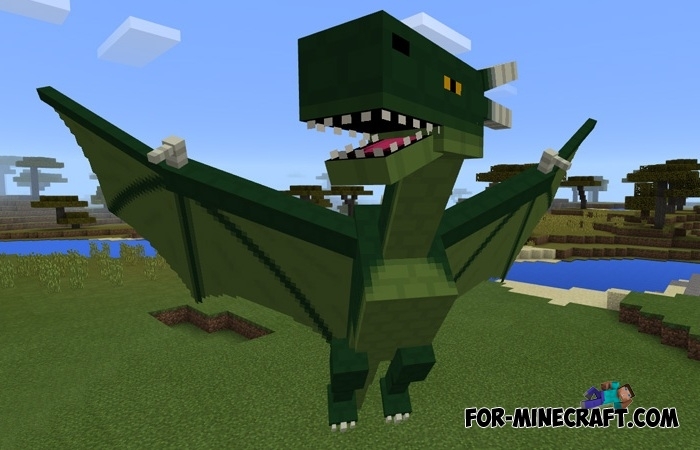 Amazing Mobs is a large addon which reveals the essence of such modifications for MCPE. The addon replaces the usual creatures with mythological ones having their own unique abilities. Almost all of them are a threat to you and will attack you in different ways. In fact, the addon shows all the best features of addons created by simple players. How to install the Amazing Mobs addon? Start the game and activate the downloaded files in the world settings (behavior and resource packs). Let's describe new creatures. The creator has added a lot of very different mobs, each one has a fine texture and enhanced features. Currently there are 10 new mobs, some of them have different color options. 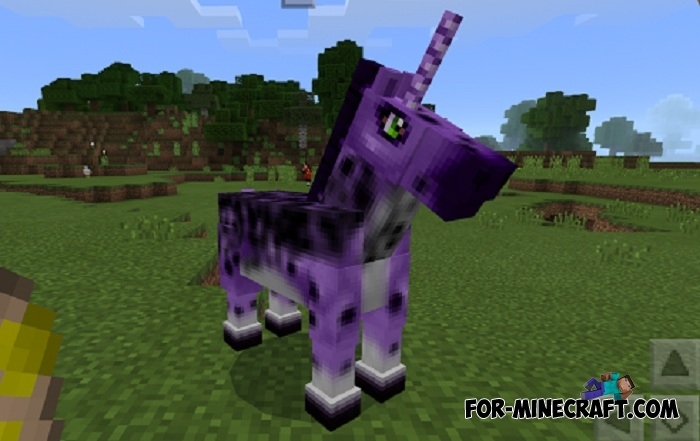 For example, you can find unicorns with a unique color and pattern. Initially, can be divided all the mobs into the neutral and aggressive. But the second type is more than the first one, so we will briefly describe some of the creatures. Ents is some semblance of tree but with significant differences. The ents attack all moving mobs without notice and cause powerful damage. 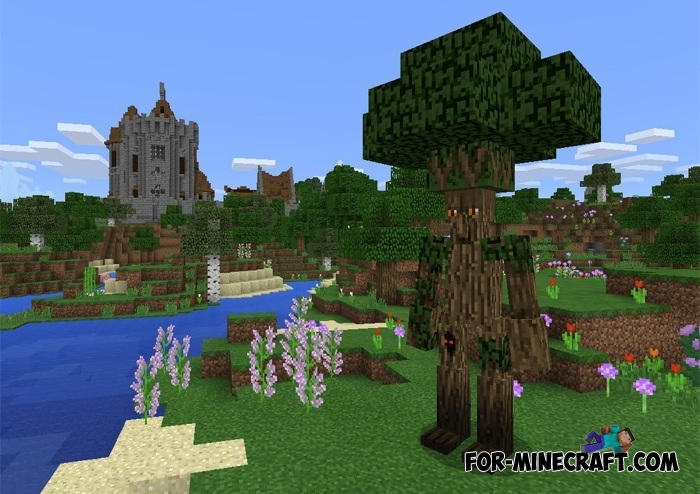 You will see the Ents even being at a great distance because this mob is quite large and can be compared to a tree. Unfortunately, it does not drop wood or leaves but it looks cool. Medusa. It replaces an enderman, so you will see a small purple glow surrounding it. Best option for you is not to approach it and try to avoid a meeting. 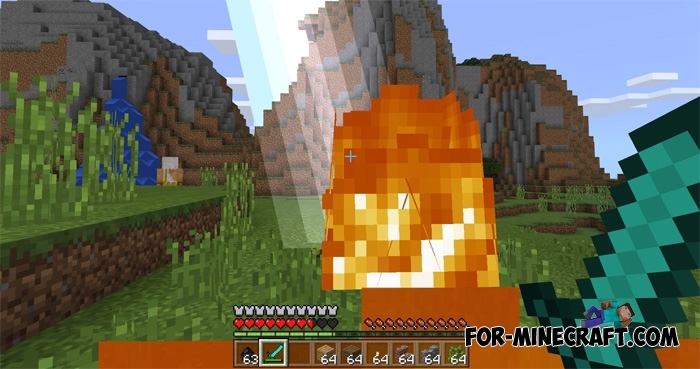 Medusa is several times more dangerous than most of mobs from the Amazing Mobs addon and can kill you in a matter of seconds. Manticore is an unusual animal that can be tamed and become your good helper (look for a Manticore baby and feed it with meat). A nice feature is the ability to ride it. Moreover Manticore is neutral, but will attack you if you hit it. 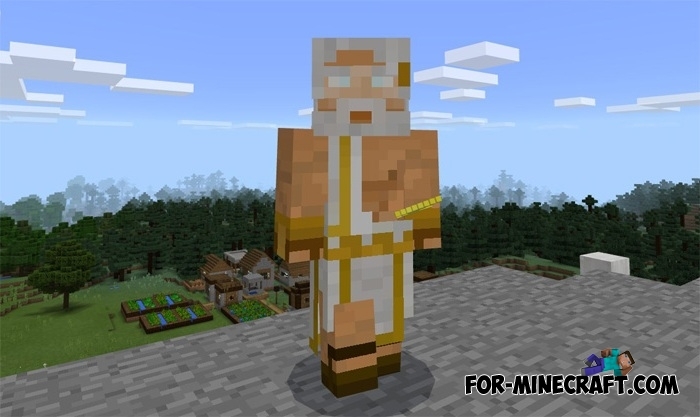 Zeus is the ancient Greek god who was added to Minecraft PE. It refers neutrally to you, but thus it is very strong and will shoot lightning if you want to fight him. Zeus can not be tamed, and you can not feed him, but this is a great character who can do a lot. Scorpion. When you install this addon, you will immediately notice two types of scorpions. It is not surprising, because there are two different scorpion. The first type of scorpion is neutral and can be used as a means of transportation. The second type is aggressive and you will immediately understand who is who. It's not all the creatures from the addon, but they abound here, as you already understood. It is advisable to carry a weapon, since these creatures are dangerous and always a threat. To spawn open the creative inventory and take all sorts of different eggs. In survival mode, you do not have to do anything, new mobs will spawn by yourself without your participation. In addition, all mobs live in the ordinary world, and you can always stumble upon one of them. By experimenting you tame and grow up some baby.